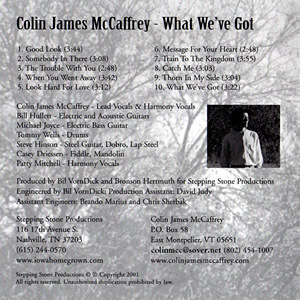 Colin James McCaffrey's debut CD What We've Got features him singing on 10 of his self-penned Country, Bluegrass and Folk/Rock songs. Colin made his break into the Nashville scene as a songwriter, through his publisher Bronson Herrmuth (Ozone Ramblers, Suzy Bogguss) in November 1999. Featured on all of his songwriting demos, Colin's voice quickly caught the ears of producers and players around town. In December of 2000, on his third trip to Music City, Colin went into the famous Masterlink Studio on Music Row with Grammy winning producer Bil VornDick (Alison Krauss, Bela Fleck, Ralph Stanley) and Bronson to cut his first album. Recorded in 5 days, What We've Got features Patty Mitchell (one-time member of the Dixie Chicks) singing harmony vocals, Billy Hullett on guitars, Michael Joyce on Bass, Tommy Wells on drums, Steve Hinson on pedal steel and dobro, and Casey Driessen on fiddle and mandolin. Colin's clear and unique voice has been described as a combination of James Taylor, Randy Travis, Ronnie Milsap, and Don Williams. What We've Got displays his flexibility and ability to combine Country, AAA, Acoustic Folk, Rock, and Bluegrass into a refreshing and unique sound . 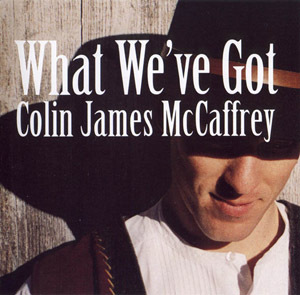 The catchy title cut "What We've Got" is straight ahead up-beat country; "Message For Your Heart" is strong and driving rock; "Good Look" and "Look Hard For Love" are smooth and accessible pop/country; "The Trouble With You" and "Catch Me" are all infectious Acoustic Rock songs with a twang. The more traditional sounding "Train To The Kingdom" and "When You Went Away" highlight Colin's soulful singing and powerful songwriting in the Bluegrass and Folk style. "What We've Got" is a collection of well crafted, hook-laden songs that display emotional depth and intensity. ... tunes with effortless rhymes and the kind of sing-alongable, catchy melodies that stay with you ...James Taylor with more twang...well-written lite-country songs with hooky choruses, brilliant accompaniment by crack players, and impeccable production...The 10 songs here are mostly about love desired, obtained or lost, and McCaffrey manages the sentiments without the saccharine... Among these, the title track and "Message For Your Heart" are the most memorable, though the slower ballad, "When You Went Away," is pretty sweet, and features harmonies from former Dixie Chick Patty Mitchell. But because it is the most unique, my favorite cut here is the wistful "Train to the Kingdom."... Very pretty. Copyright ©2013 Colin James McCaffrey. All rights reserved.